Just a short and sweet post today to give a shout out to Fujitsu. Thanks for keeping us covered during our typical winter weather here in the Pacific Northwest!! 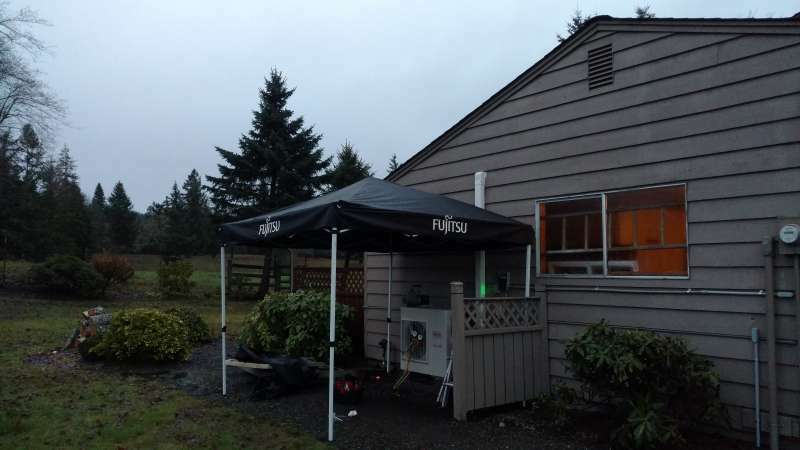 These little shelters sure do make a wet job that much easier and we are grateful to our supplier, Fujitsu America, for providing us with these handy little tents. And speaking of Fujitsu, there are just a few days left in the year to take advantage of our End-of- Year-Blow-Out Special on Fujitsu Ductless Systems. We are offering $450 off Industry Leading Fujitsu 12K and 15K RLS3s Ductless Heating and Cooling Systems through the end of 2015. These are amazing high, quality systems that will keep you comfortable year round. Low rate or 6 months same as cash financing is also available and don't forget to ask about local utility rebates to cash in on even more savings. Call today to schedule your free, in-home estimate! !